Your entryway is how you introduce your home to new guests. It is also the place where you drop your keys or hang up your coat. So, it needs to serve both functional and decorative purposes. You can use these entryway decor ideas for inspiration and places to start. Start with a welcome sign or a wall mirror. Add a place to sit and store shoes. Mix in some stylish accessories for the final look. Can you list all the things that call your entry home? Coats, hats, gloves, and scarves are likely residents during the winter. Keys, purses, school bags, and briefcases may be year-round residents. Do you typically drop the mail in the entry as well? No matter what you need to organize, you will find a practical, yet stylish, option among these 45 entryway decor ideas. 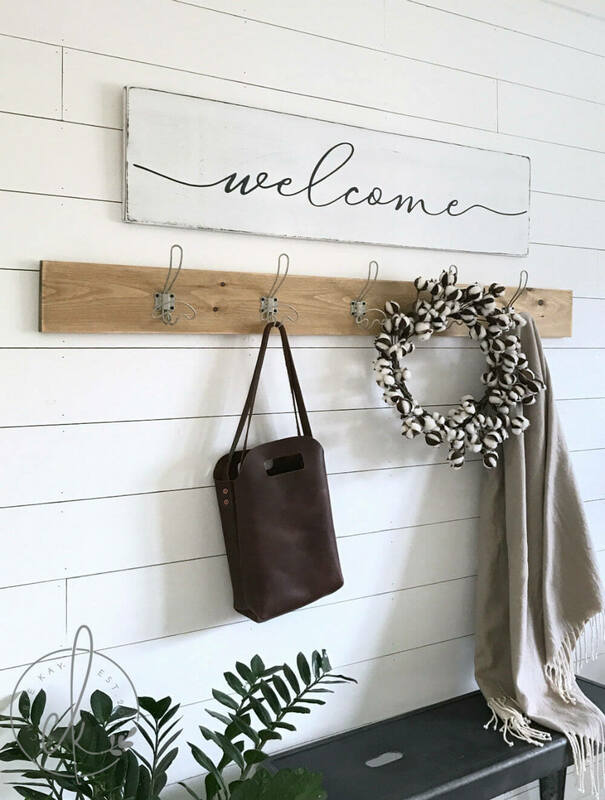 A welcome sign, a cozy bench, a shelf with a family photo – these are the accessories which turn a boring entryway into a special place that makes your guests feel at home. You can customize many of these entryway decor ideas, to create a look that fits your style. Mix and match throughout the year to freshen things up. Which one of these ideas do you want to start with? Charcoal grey lettering on a warm white background makes it easy for this welcome sign to fit into any decor. Measuring 47 inches long and 11.25 inches high, the painted letter flows gently in a beautiful cursive font. Minor distressing enhances the warmth conveyed by this sign. Wire hangers on the back make it easy to mount. Never lose your keys or your dog’s leash again. 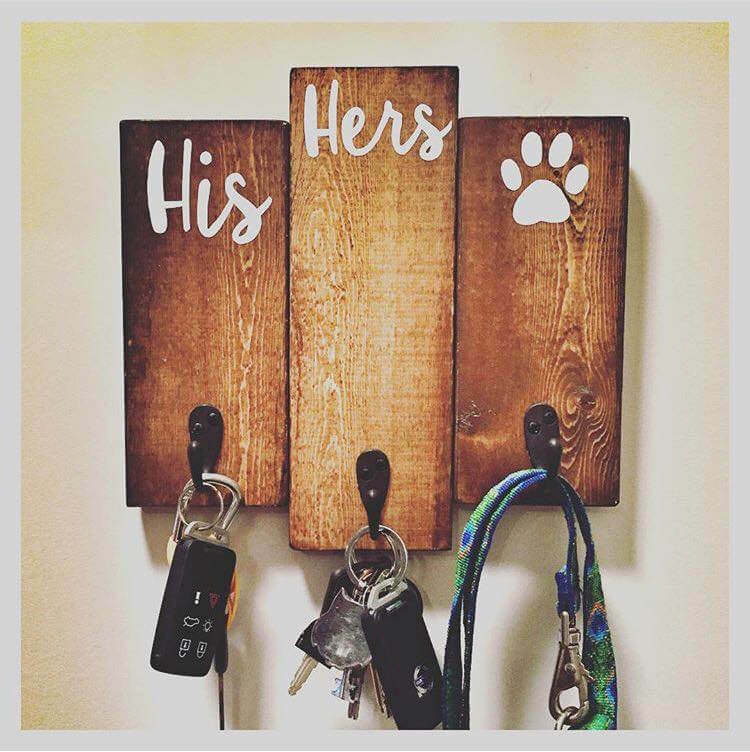 This sign offers a place for your keys, your partner’s keys and the dog’s leash, all in a compact 11-inch by 10-inch sign. Hand-painted and hand-distressed, this sign’s finish helps bring out the natural beauty of the wood grain and distressed exterior. 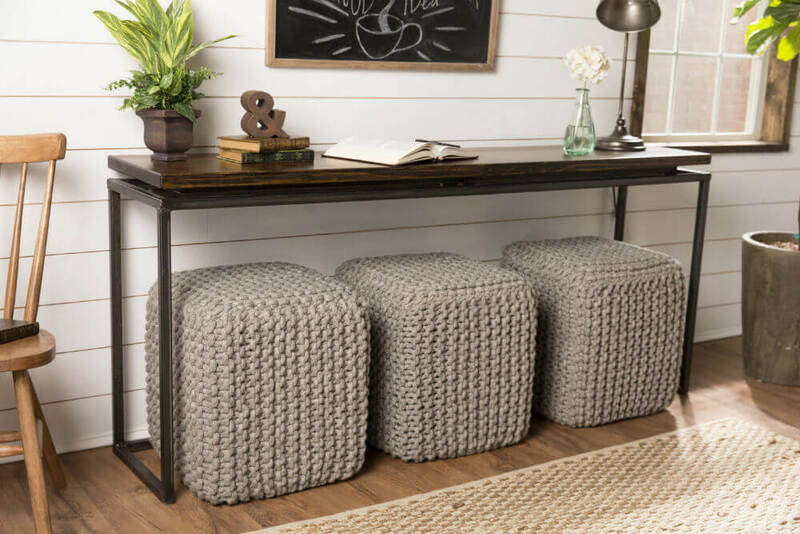 Want to bring a touch of rustic elegance to your entryway, bathroom, or dining room? 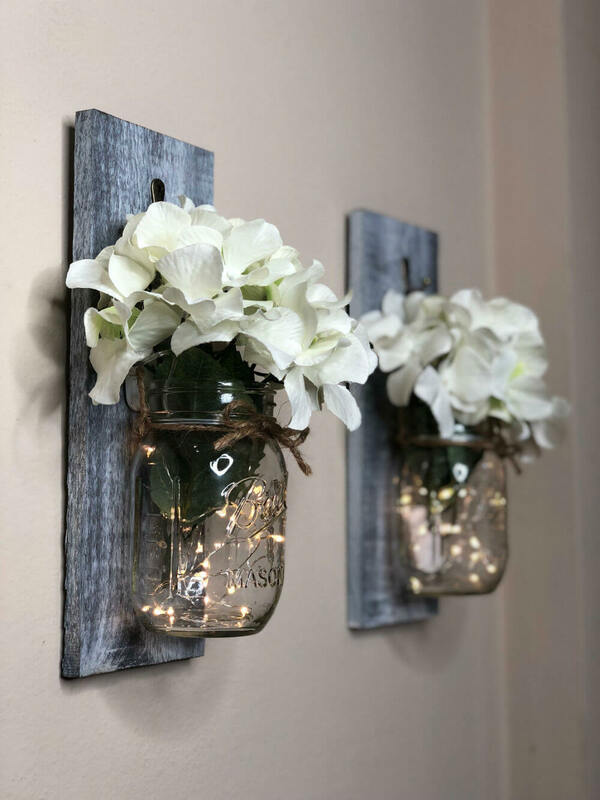 These Mason jar sconces are the perfect option. Pallet wood provides the solid base from which the jars hang. Rough twine holds the jars to the hooks. Each jar is filled with lights or flowers for the perfect touch. 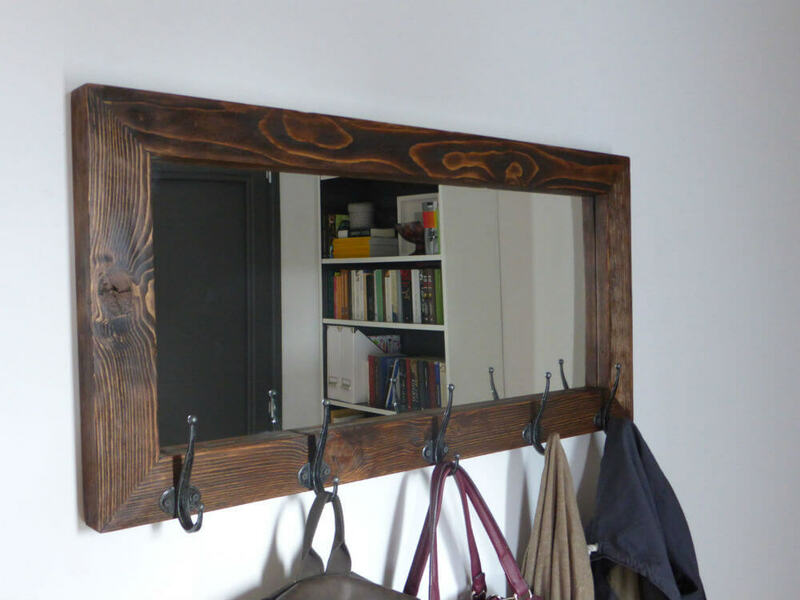 Substantial rustic wood pieces form the frame around this mirror. Measuring 36 inches wide and just under 18 inches tall, the frame of this mirror is 2 3/4 inches thick. 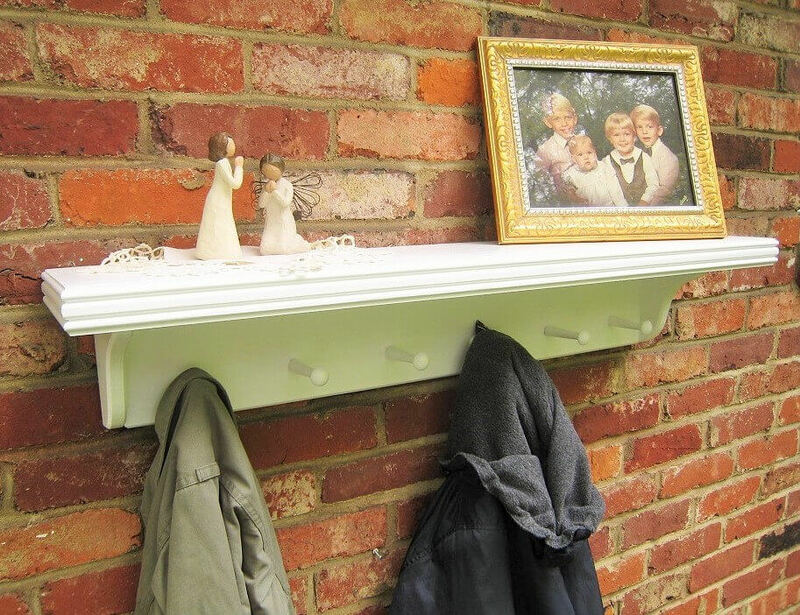 This provides a sturdy base for the five coat hooks that hang along the bottom edge. 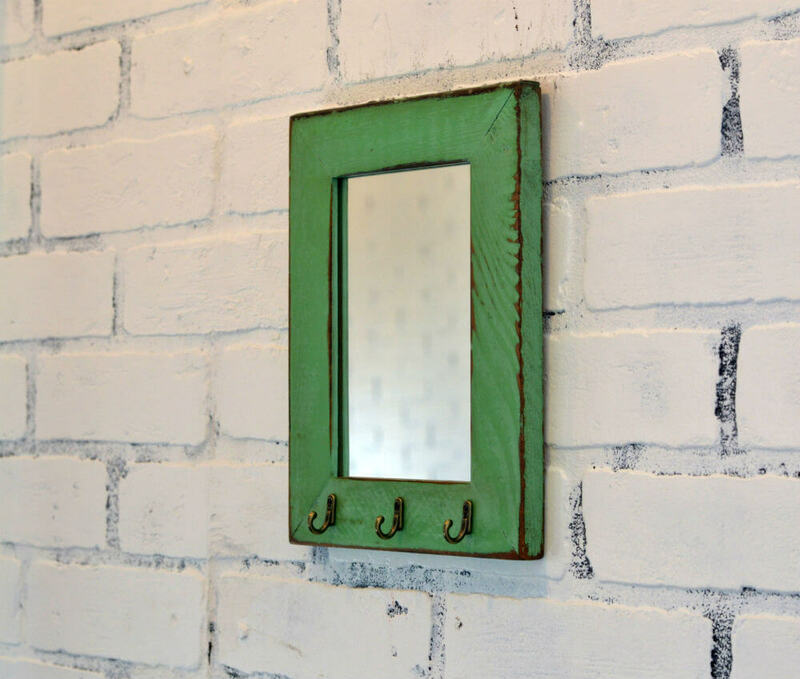 Handmade in Greece, this mirror stands out among entryway decor ideas. Windows are special portals into the world outside. Decorating with a window frame gives the illusion that there is something beyond. This vintage blue painted window frame works well mounted on a wall or standing on a mantel. 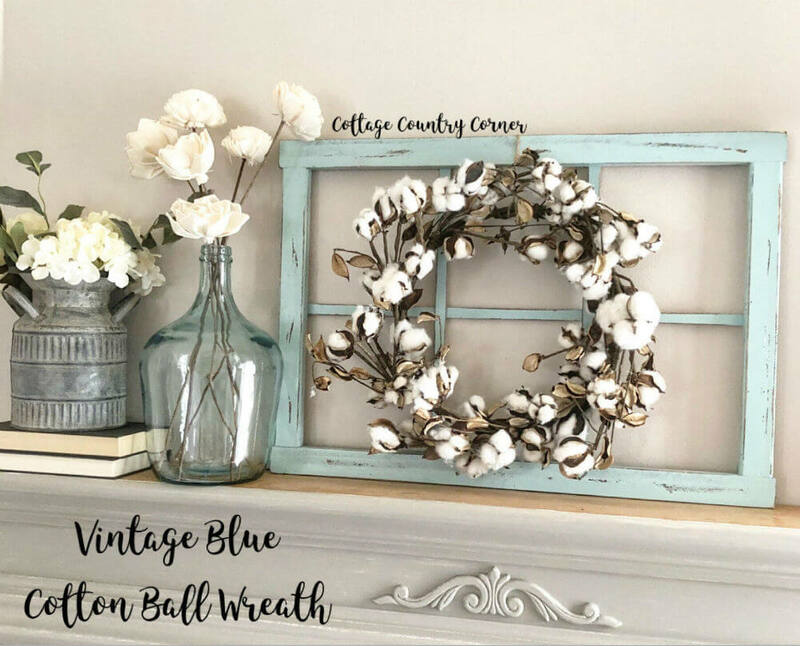 A beautiful wreath of white cotton balls provides a textural element to finish this rustic window. Shoes can quickly clutter up an entryway. 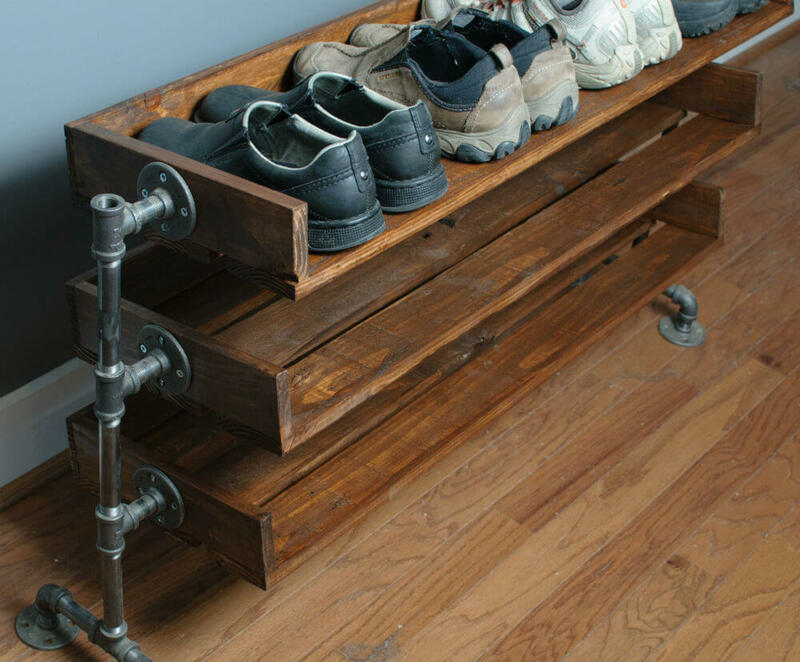 Get your shoes organized in this customizable shoe stand, made from reclaimed lumber standing on legs made of pipe. You choose the number of levels, each of which holds 3 pairs of large shoes. The piece is 45 inches with legs attached. The height will vary by the number of levels you order. 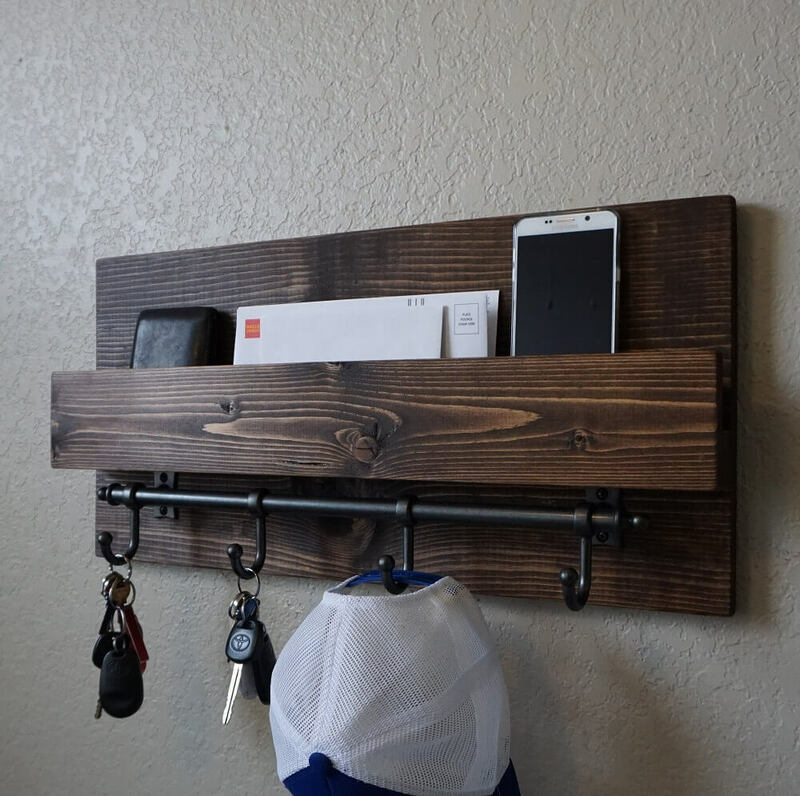 Keys, mail and personal electronics are just a few things you can store on this modern rustic entryway organizer. A dark bronze rail hangs below with four hooks, perfect for hanging keys, the dog’s leash, or even your favorite ball cap. Measuring 23 inches wide and 11.25 inches tall, this organizer works well in even the tightest spaces. Looking for a great housewarming gift for yourself or a friend? This welcome sign is the answer. 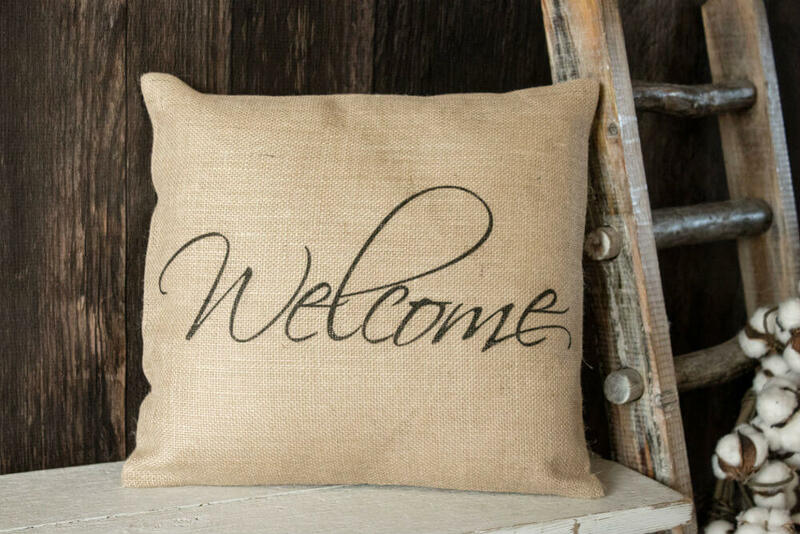 The handwritten script highlights the warmth of the greeting a guest, whether you hang it in the entryway, kitchen or guest room. Available in multiple sizes and finishes, you can find the exact one for your home. 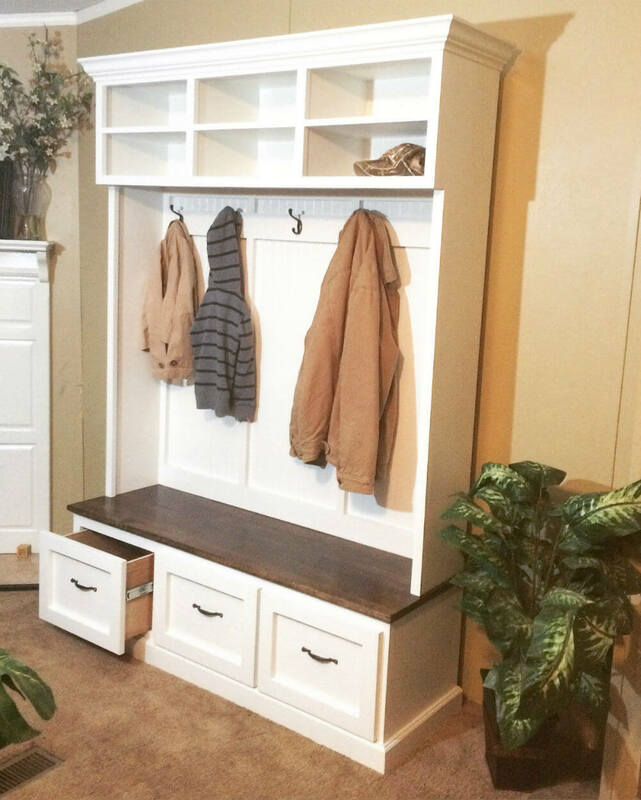 Organizing shoes, coats, and everyday items are easy with this all-in-one entryway bench with built-in storage. Open cubbies up above are perfect for hats, gloves, and scarves. Hooks hang along the back wall for coats and backpacks. Drawers below the bench give a place to stash shoes. Among entryway decor ideas, it marries practical and beautiful. A handmade planter box holds a line of Mason jars painted with chalk paint. Each jar embraces a bouquet of cream roses. Finished in a snow-white wash, hand lettering in slate grey welcomes one and all to your home. This beautiful centerpiece is available with 4 to 6 jars, so you can size it to your available space. 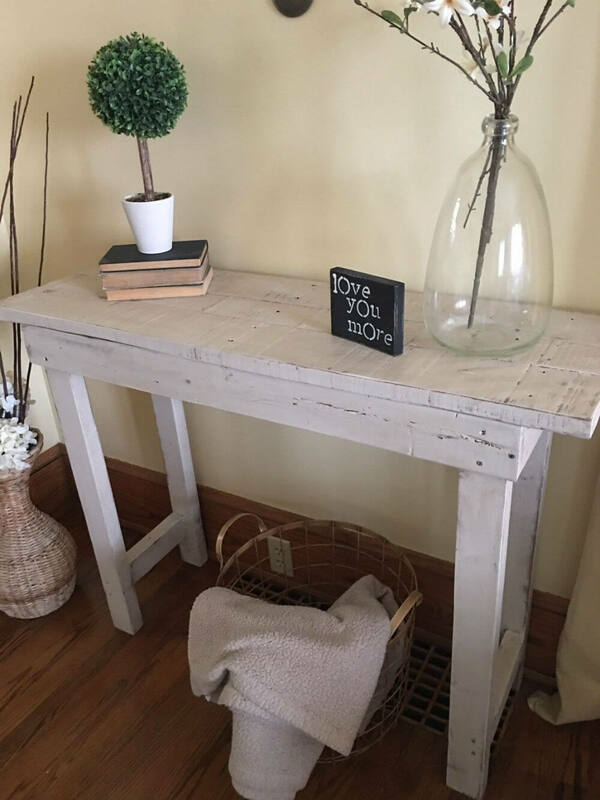 Simple and rustic are the perfect descriptors for this solid wood entryway table. Each piece is custom made after the order is placed. Every piece of wood used to create this furniture masterpiece has its own grain, knots and distress marks, making every table unique. The straightforward design makes it visually interesting yet elegantly simple. 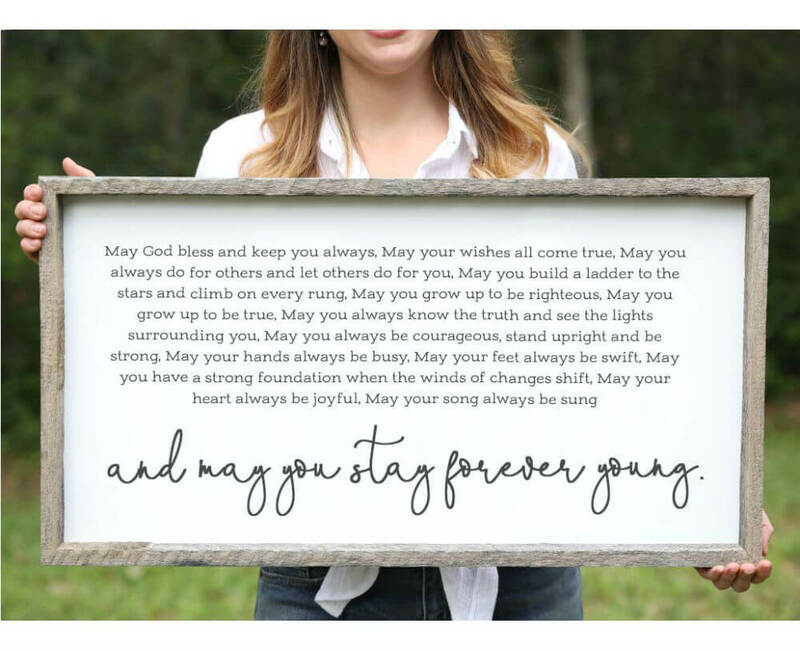 This rustic sign offers the wishes of a parent to a child, on living a fabulous life with the goal of staying forever young. Framed in weathered barn wood, this sign offers distressed grey text on an off-white background, making it a perfect addition to any color scheme. 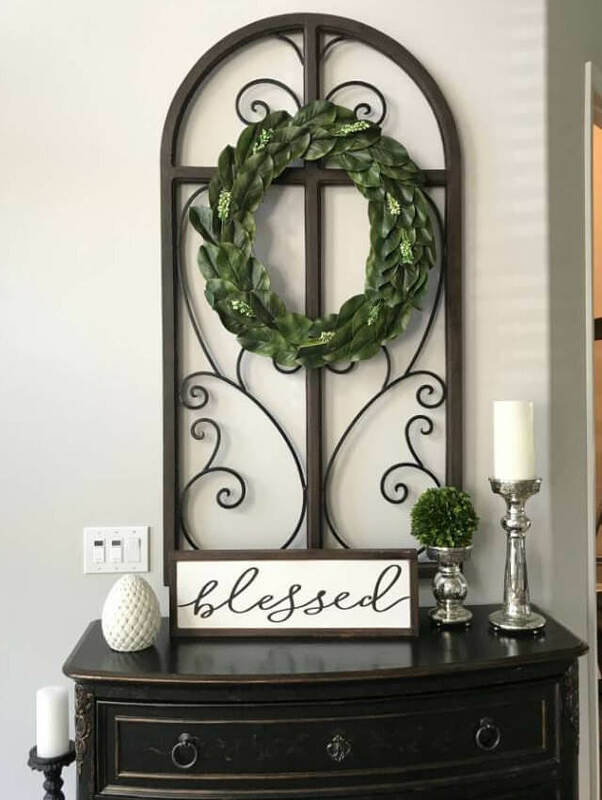 This beautiful message stands out among entryway decor ideas. Hooks offer a practical way to hang coats, hats, and purses in a tight space. And hooks don’t have to be made from metal. These walnut disks bring the beauty of natural wood into your entryway while providing a practical place for all your stuff. The clean disks offer a modern sensibility with a natural vibe. Mirrors reflect light, as well as the image of our faces. This rusticly beautiful mirror does both quite well. 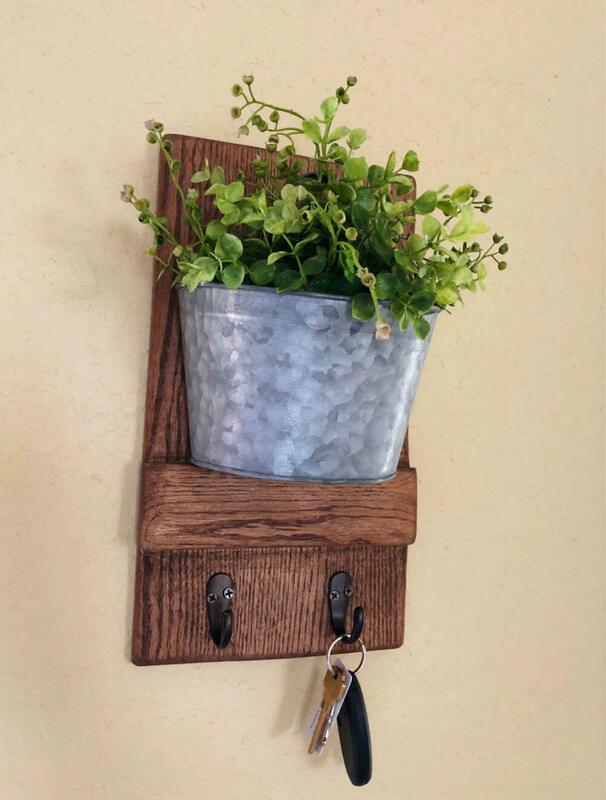 Framed in painted reclaimed wood, this practical wall hanging offers three hooks to keep your keys organized. Mounted using two Z bars it will always hang straight. You pick the finish to match your decor. Magnolia leaves offer a rich green color as well as a beautiful matte sheen. This faux magnolia leaf wreath is beautiful in its simple symmetry. Tiny white flowers highlight the layers of magnolia leaves, all set atop a grapevine base. Made from the highest quality materials, this wreath can go inside or out, at any time of the year. 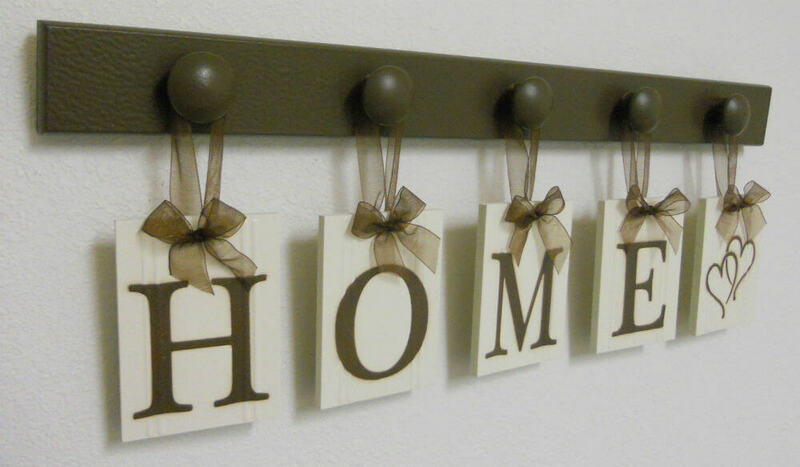 Hanging tiles, dangling from organza bows, combine to create the message “Home with a Heart”. A perfect gift for a wedding, anniversary, or bridal shower, this unique sign is also perfect for your home. It is completely customizable with up to 12 tiles, which can be any combination of letters, numbers or symbols. 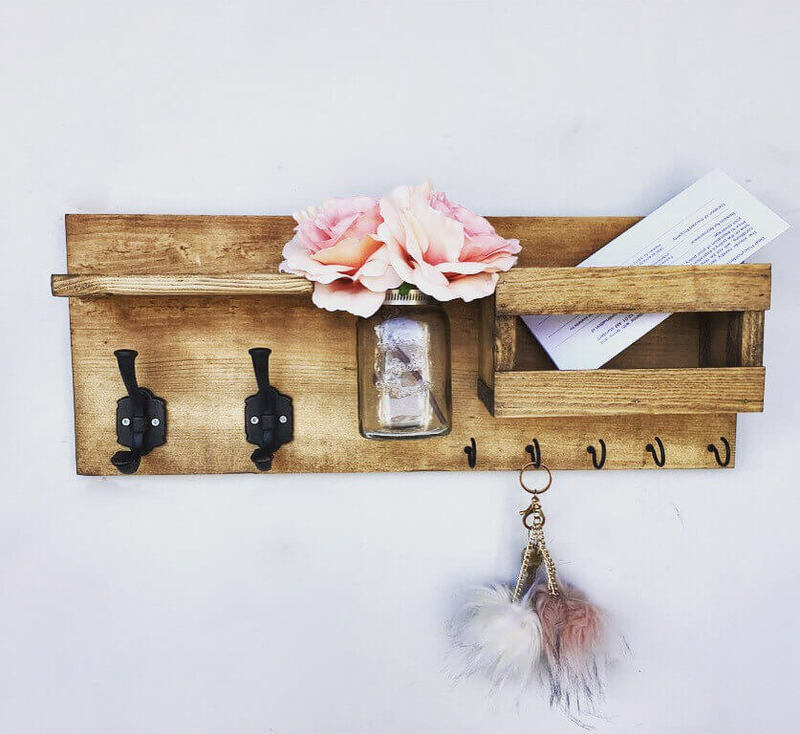 Give your towels or coats a special place to hang with this reclaimed wood organizer. Made from white-washed lath taken from a vintage tobacco barn, this coat rack features a 1.5-inch deep shelf on top and keyhole hooks on the bottom. It’s strong enough to handle your heaviest winter coat or a set of wet towels. Do you want to add something unique to your porch? These two large wooden vases are standouts in the world of entryway decor ideas. Made from 6 inches by 6-inch reclaimed lumber, one vase is 24 inches tall while the other is 18 inches tall. 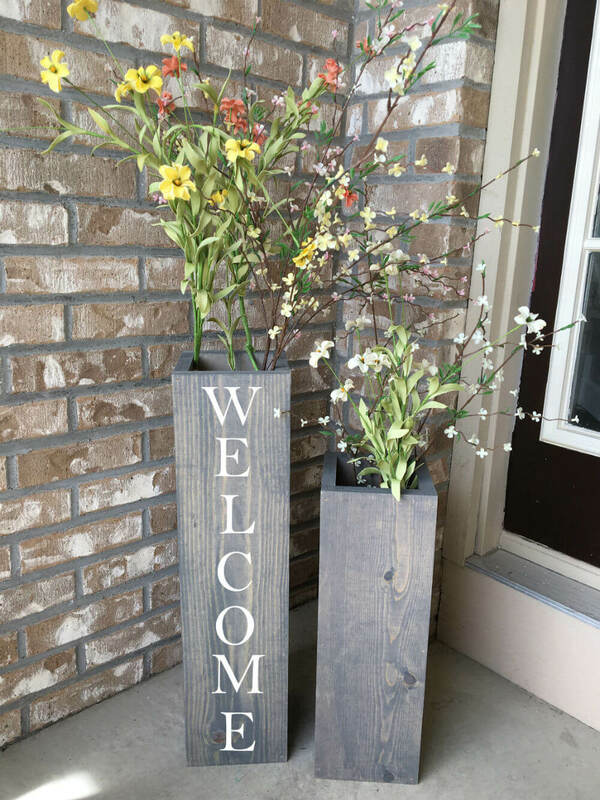 Both vases have a grey finish, while the taller vase has the Welcome sign ready to greet your guests. Industrial meets rustic in this unique entryway table. A thick pine board, hand distressed and hand finished, provides a generous top for accessories or personal items. Pipe painted black provides the support, with a smaller board below for a decorative shelf. It measures 31.5 inches high, 11 inches deep and 36 inches wide. 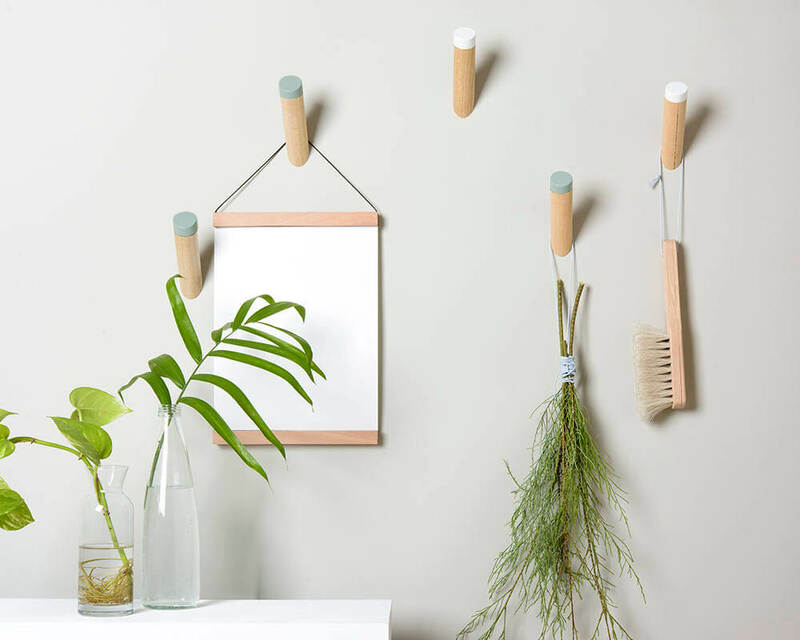 Small everyday items are easy to manage with the help of this handy shelf and hook organizer. Handmade and custom stained, this organizer works for corralling and organizing small items in an entryway, bathroom or home office. The shelf is 24 inches wide, 14.5 inches tall and 4.5 inches deep, with 3.5 inch deep shelves. 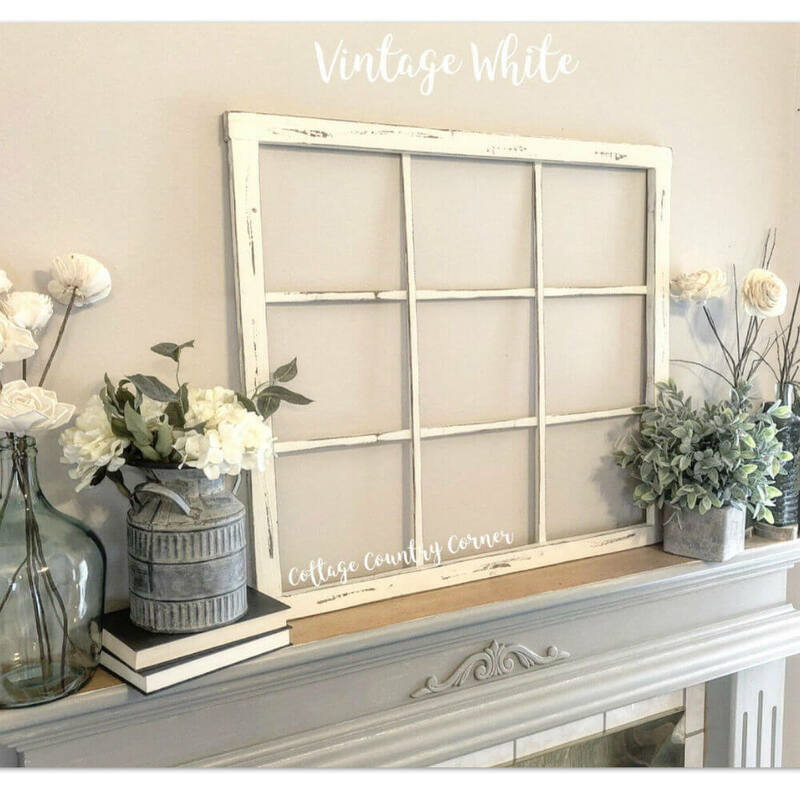 A simple white window frame offers the perfect backdrop for any mantle or tablescape. 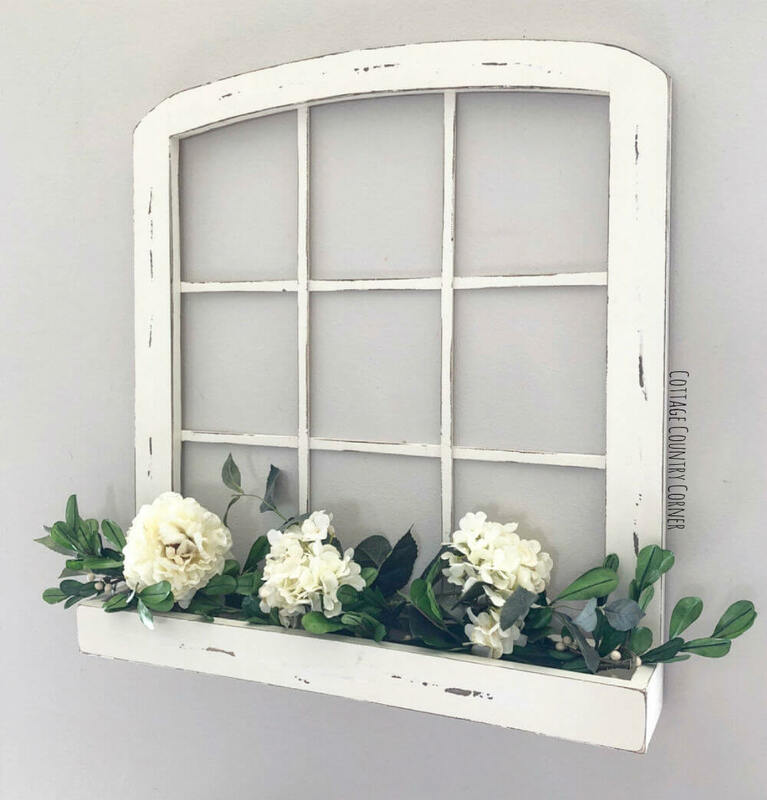 This faux window frame sports nine pane openings. Made from pine and birch, the frame is hand distressed and finished for a totally custom look. Customers can choose to have a wreath included or not. It measures 32 inches wide and 38 inches tall. This beautifully handcrafted wooden shelf gives you both functionality and decorating space. Shaker pegs lined up below are the perfect place to hang coats, purses, and hats. The 8-inch deep shelf above has enough room for displaying family photos or holding books in a nursery. Decorative edging finishes the look of this beautiful masterpiece. A household of pets is a joy to many people. However, for some, it may be too much. Give your guests fair warning that your home has four-legged friends. 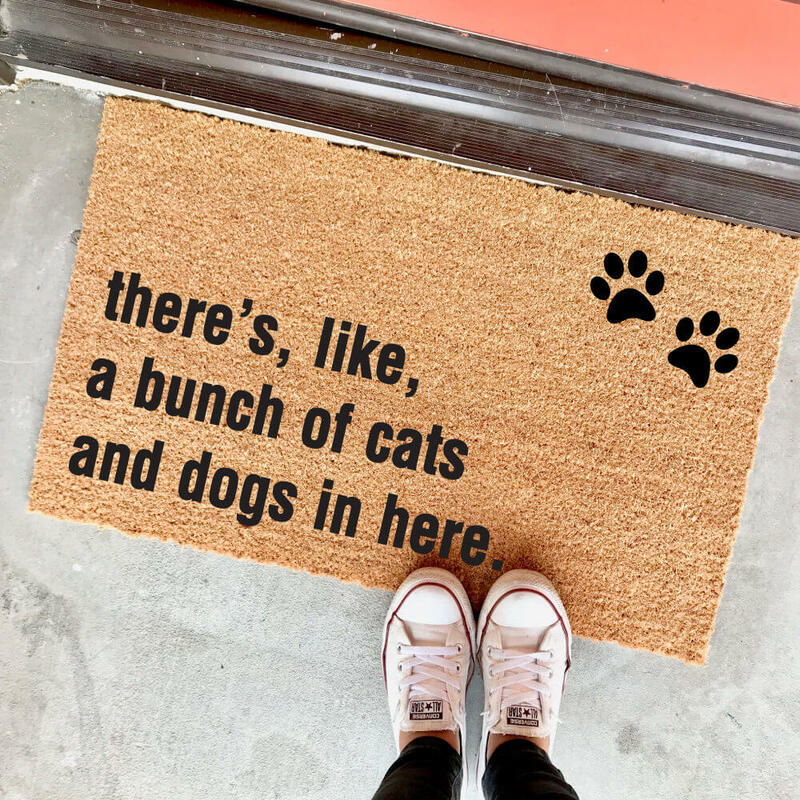 This sturdy doormat sports handmade lettering tell your guests there are a bunch of cats and dogs in the house. No one said entryway decor ideas should be confined to human family members alone. Do you have a bench in your entryway or on your porch? Made from fine burlap and fully lined, this pillow includes both the case and the pillow insert. Cursive script welcomes guests in a warm brown tone. The square pillow is available in 12 inch, 14 inch and 16-inch sizes. 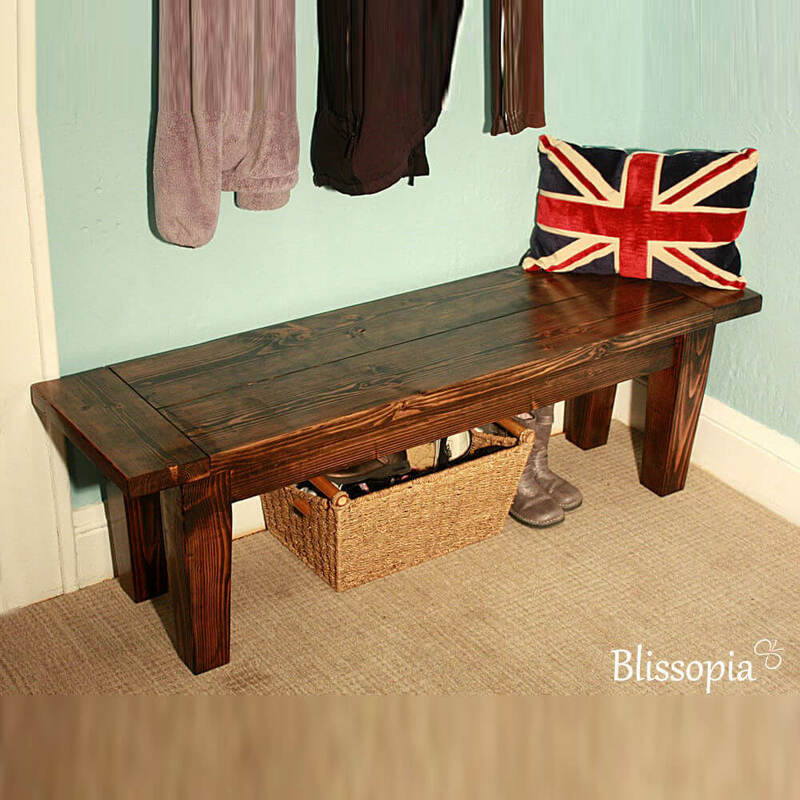 Winter boots and high heel shoes both have a place in this solid wood bench and shoe rack. The top is stained to the customer’s specification while the bottom is painted white. 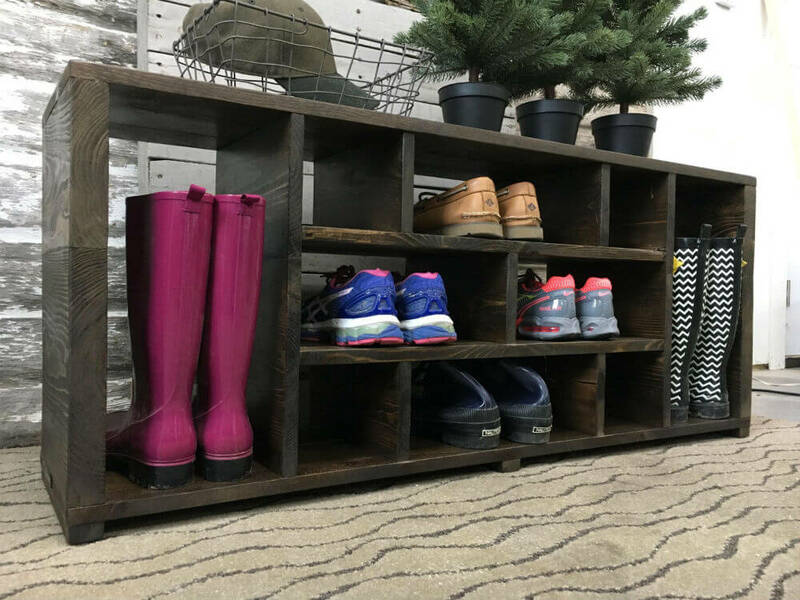 There are two shelves on one side for shoe storage, with a single shelf on the other side, perfect for boots or high heels. 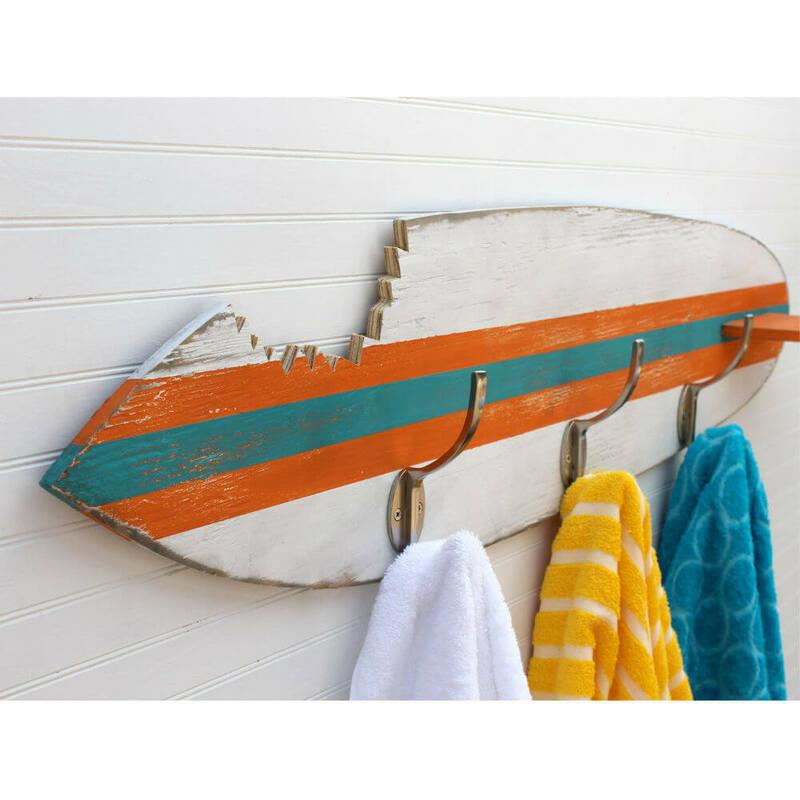 Weather-worn wood makes this surfboard towel rack fit into any rustic or beach house look. A shark’s bite cutout gives this board a special touch of character among entryway decor ideas. Painted in white, orange and blue, it works well in your bathroom or beach house. Three hooks along the bottom offer a place to hang beach towels and hats. 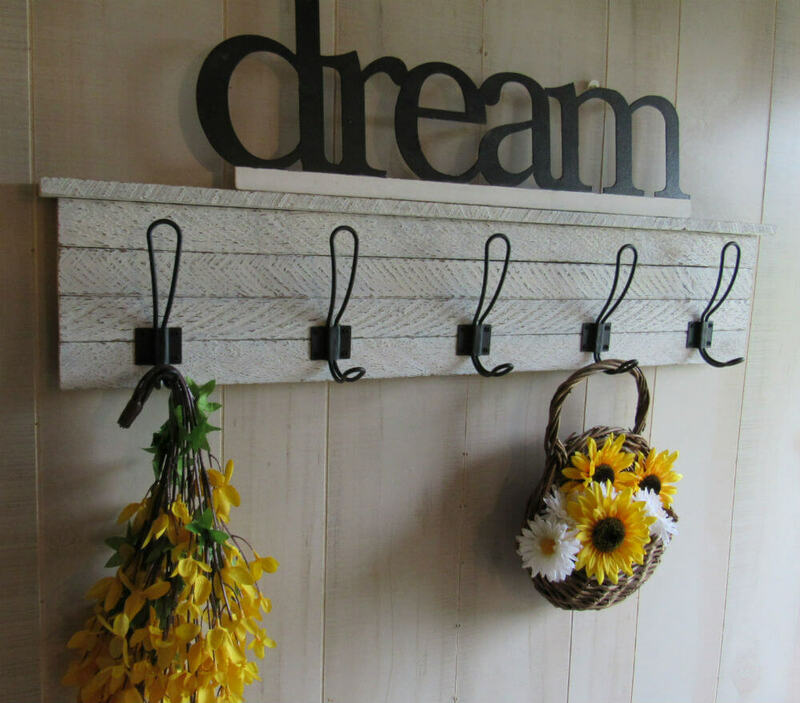 Want a farmhouse touch in your entryway or mudroom? This wall organizer starts with a solid base of reclaimed wood, with its unique beauty enhanced by a rich stain. A galvanized bucket hangs from the top, a perfect place for mail or bringing in a bit of greenery. Two key hooks below finish out this stylish yet practical entryway addition. 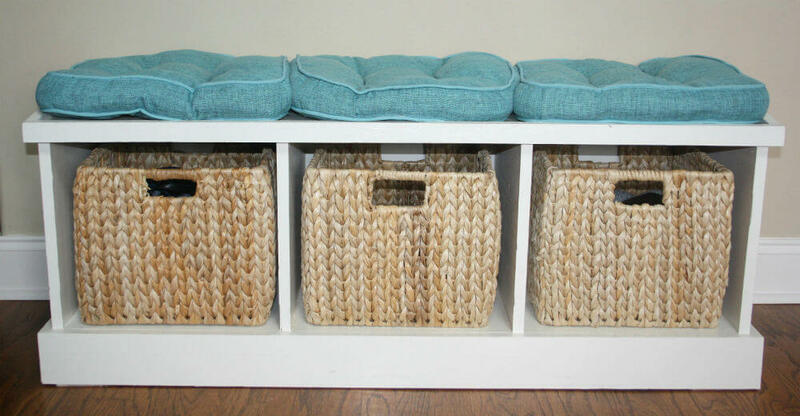 Organizing your family was never easier than with the help of this entryway bench. 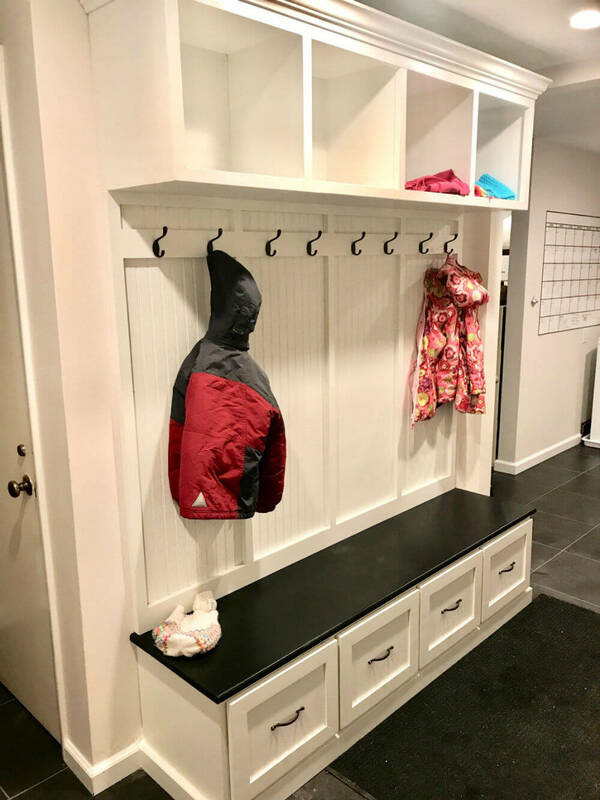 Built to go almost to ceiling height, this storage unit features cubby storage up top, hooks for coats in the middle, and a bench seat which has drawers underneath. 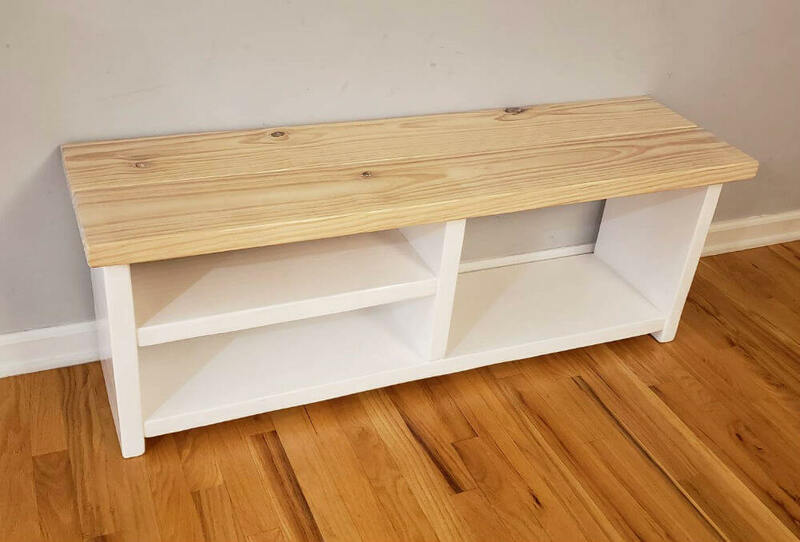 Shown in a warm white and a walnut bench finishes, you can customize the look to fit into your home. Wood stained a rich color adds an instant warmth to any space it graces. Add it to an entryway to make a welcoming statement to guests. This shoe organizer bench is both warm and welcoming while providing the optimal functional solution. Shelves capture shoes and boots, while the top is perfect for sitting down to change footwear. Mail, keys, coat, purse. Made from quality rustic pine, this entryway organizer gives you a place for everything you need walking out the door. A small shelf and mail slot adorn the top along with a place for greenery. Coat hooks to one side and key hooks to the other capture hanging items. A beautiful stain makes it welcoming addition to your entryway. Sometimes the beauty of a piece is in the architecture it brings to a space. 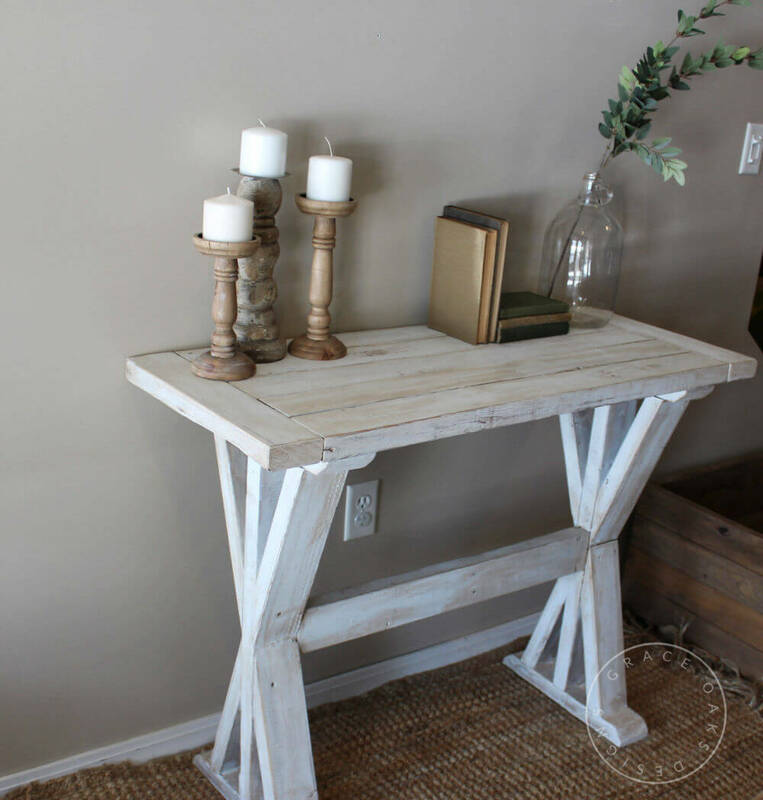 The X-base pedestal of this beautiful farmhouse entry table is the perfect example. The well-constructed wide top makes this table versatile in the entryway, dining room or living room. The simple, slightly distressed finish lets it fit into any decor. Hanging your coat up is quite easy with an angled wall peg. 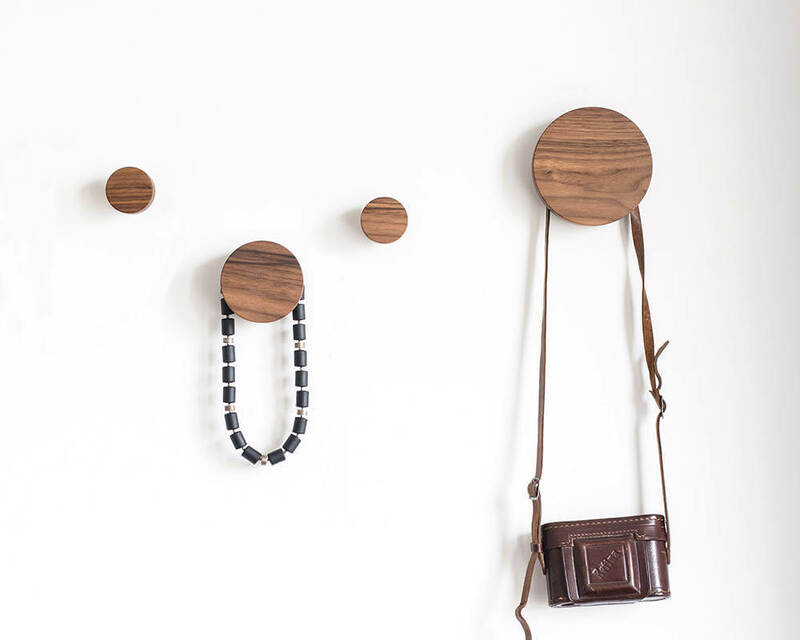 Made from oak, this wall peg offers a modern, practical sensibility in entryway decor ideas. Tipped in a color of your choice, the peg measures 4.7 inches long, with a diameter of 3.1 inches. Add one, two or more to your entryway to add both functionality and personality. Deep gold adorns the scrolls that surround this entryway mirror. 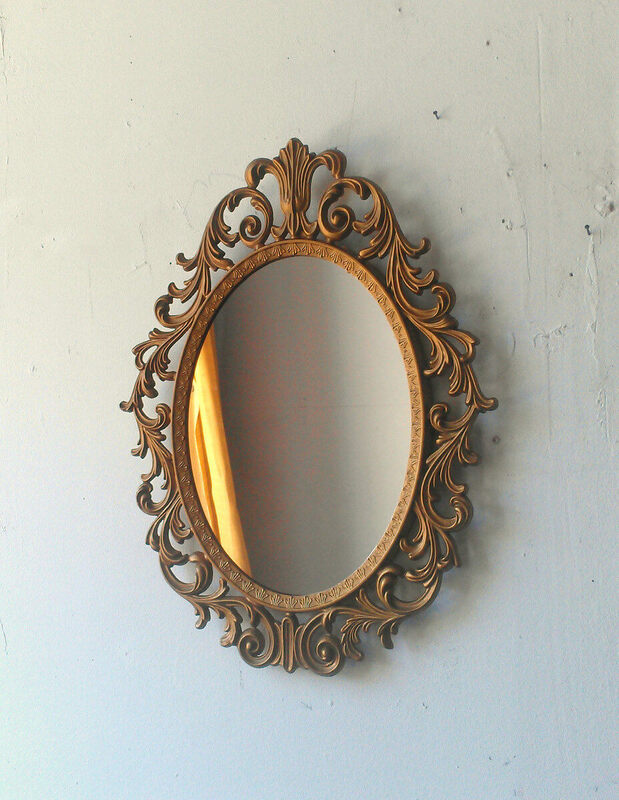 A vintage filagree frame encircles a modern mirror, offering an ornate, yet stylish, addition to any space you hang it in. From edge to edge, it measures 13 inches high and 10 inches across. Backed in decorative paper, it comes ready to adorn your walls with a bit of shine. 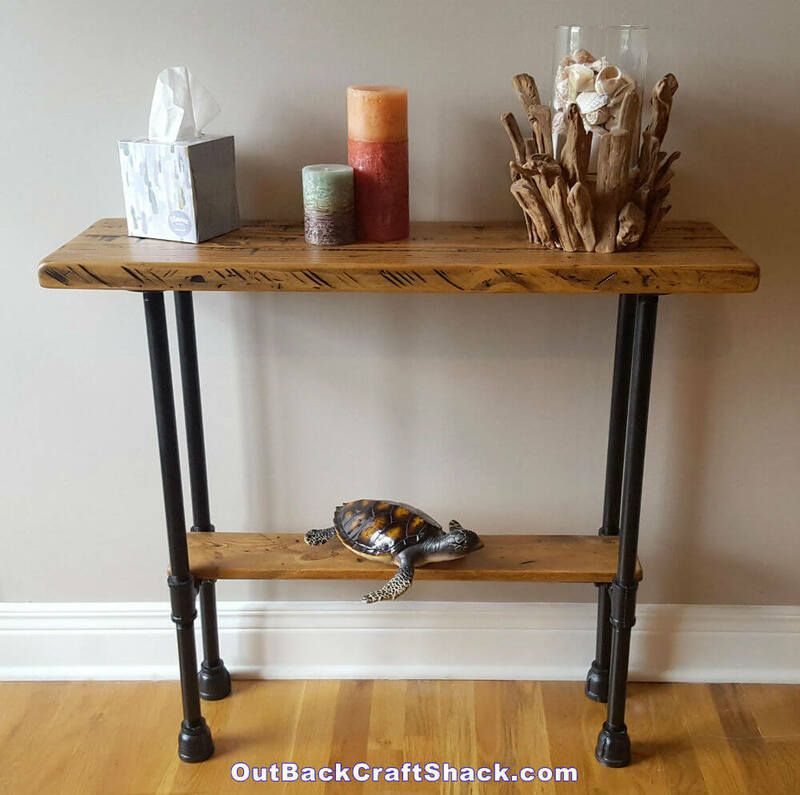 Weld lines and a distressed wooden top are just two of the beautiful, industrial touches of this unique console table. The steel base is hand welded to create a solid foundation. Distressed wood seems to float on top, enhanced with a rich stain that brings out all the wood’s unique knots and grain. An industrial touch with a vintage warmth. 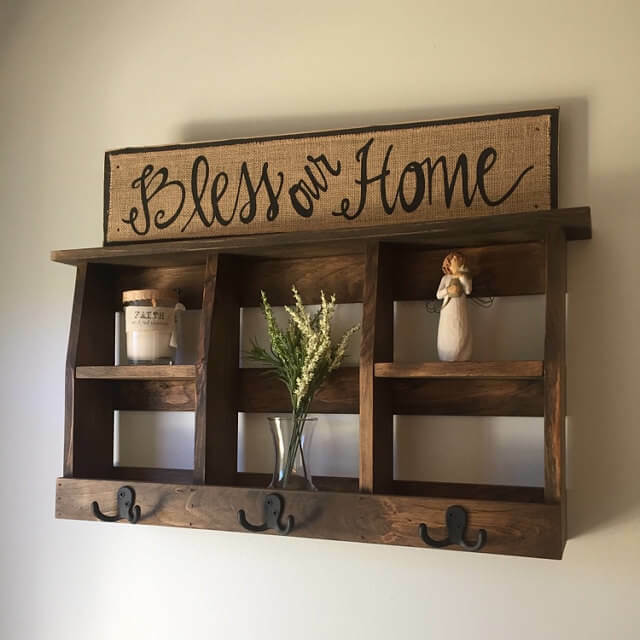 Handmade is always welcome in a farmhouse decor. This rough-hewn table looks like it was crafted from leftover lumber decades ago, complete with well-worn wood and distressed paint finish. Yet, it is solidly handcrafted from new pine wood and finished by hand. It measures 44 inches long, 14 inches wide and 33 inches high. Living in an apartment doesn’t have to stifle your decorating ideas. Wall decals make the perfect addition to enhance a wall without spending a lot of money or making unnecessary holes. 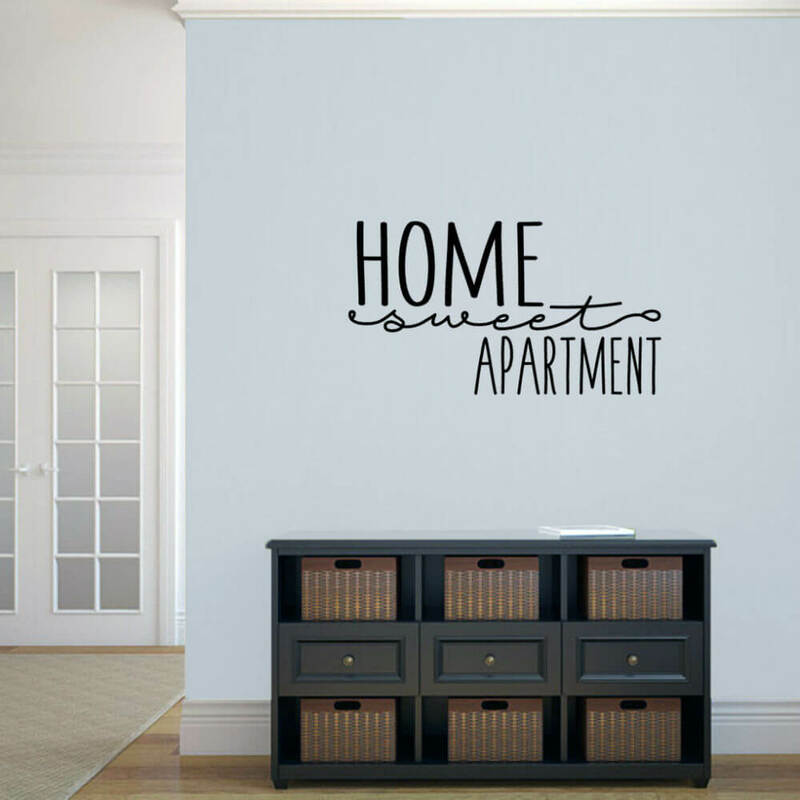 Welcoming guests with the message “Home Sweet Apartment” offers a warm feeling with a whimsical touch. Available in different sizes and colors so you can get a custom look. No two pieces of reclaimed wood are alike, with each having its own patina, flaws, and distress. 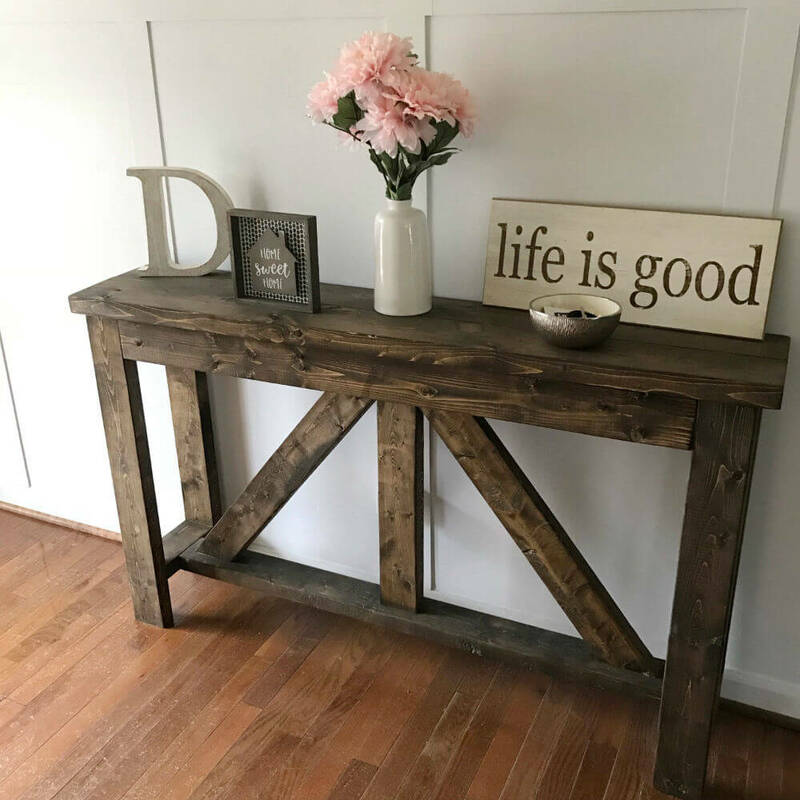 Take a few different pieces of reclaimed wood and combine them into a unique, functional art piece for your entryway. 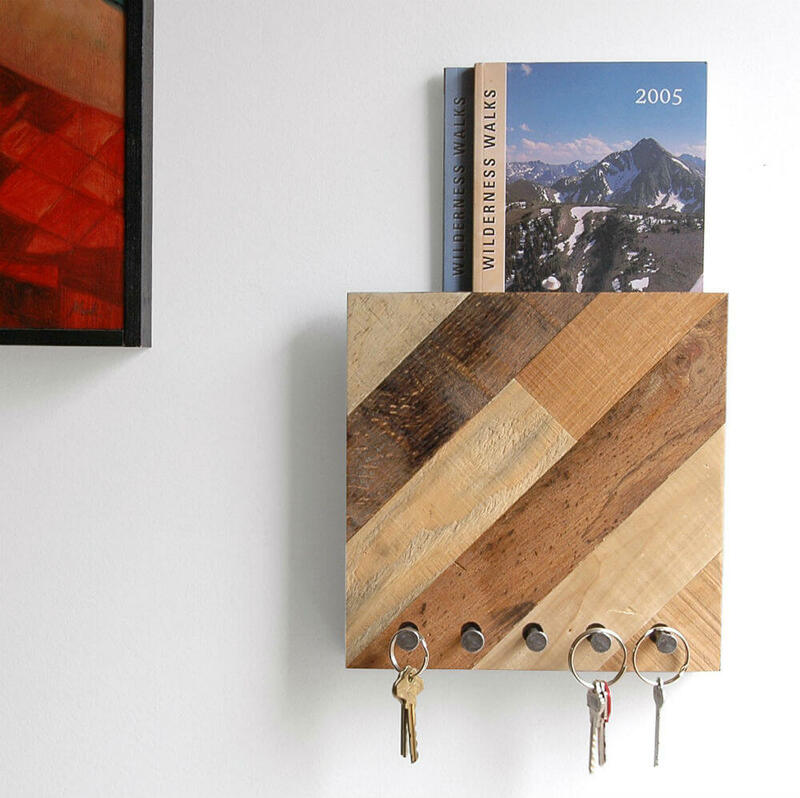 This organizer offers a slot at the top for mail and modern pegs below for hanging your keys. Beautiful and totally practical. 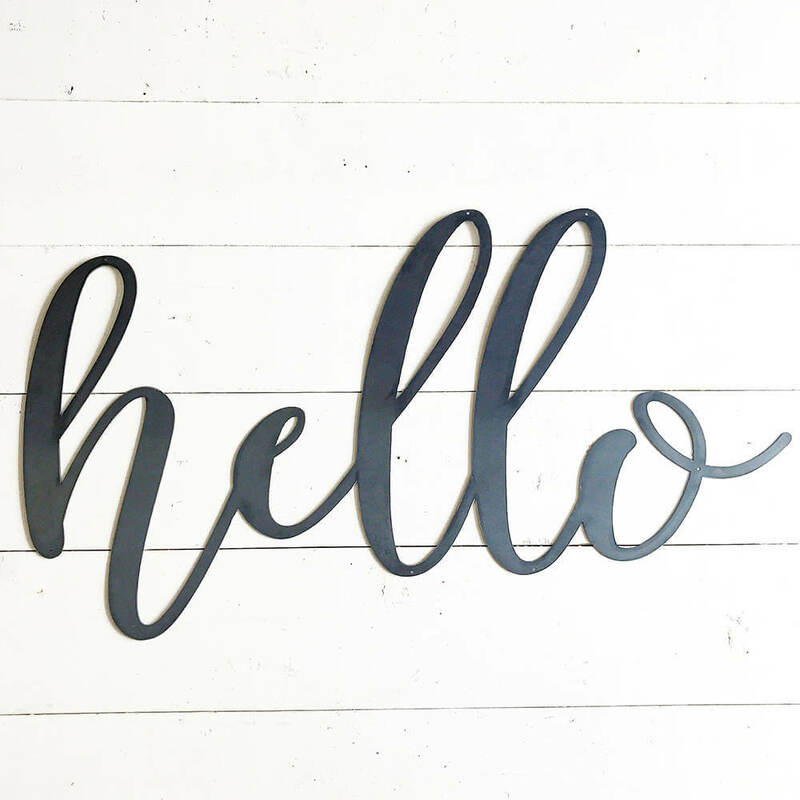 Saying hello is easy with this metal sign. Cut from 16 gauge steel, the sign proffers a welcoming “hello” in a whimsical font. It works well outside above your mailbox or doorbell. It works just as well inside on the wall or above a mantle. You can have the sign painted and sealed, or order in raw form to let it age naturally. Everyone needs a place to sit down when putting on or taking off their shoes. This solid wood bench offers the perfect place to sit down. The strong top holds the weight of a fully grown adult. Three cubby holes below offer a place to hide shoes or toys. The bench is completely customizable to fit into any space and decor. Looking for a rustic piece to adorn a specific room in your home? 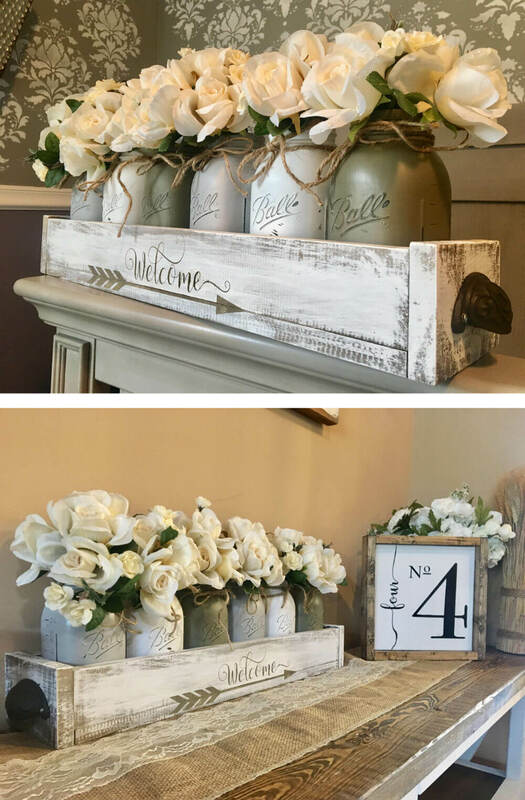 This decorative piece combines a rustic, distressed wood base and four galvanized buckets to display the greenery of your choice. 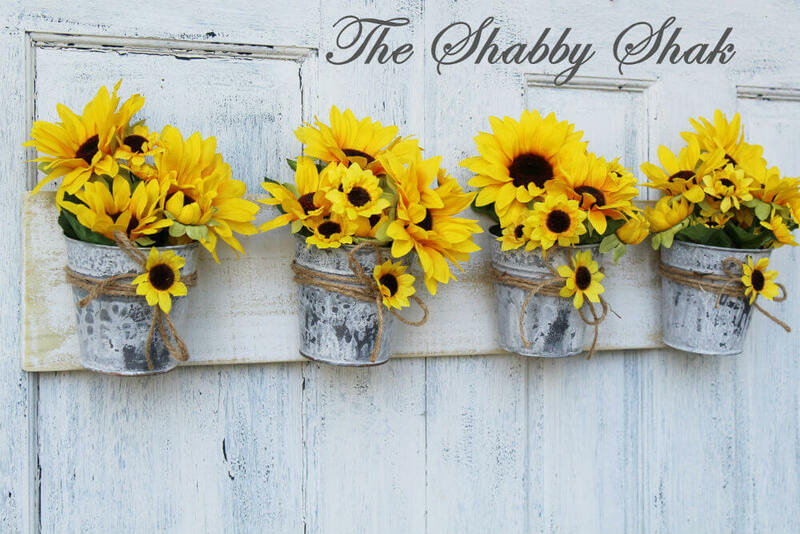 Bright, cheery sunflowers stand out against the rustic creamy white and mottled grey. Rough twine secures the buckets to the base. Mirrors offer a practical place to check your appearance, but they also add grace and elegance to the space they adorn. 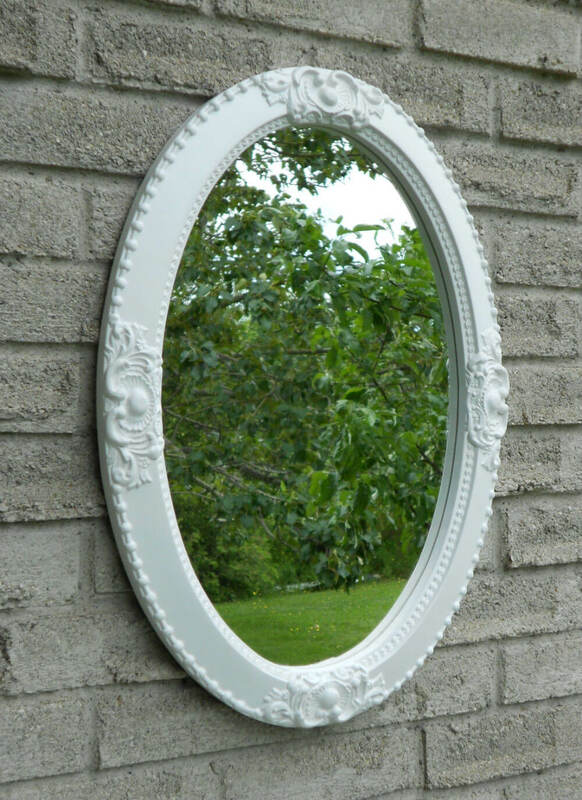 This simply shabby chic mirror makes its own statement. The intricately carved frame is washed in white so it fits well into any space. Its oval shape makes it the right choice for an entryway, nursery or guest room. The arched top of this window frame makes it an elegant addition to your entryway, dining room or living space. Made from pine and birch, this window frame’s arched top gives it a gentle grace. The planter box can hold decorative greenery or become a practical place for keys or accessories. Add a wreath for an entirely new look. Need a housewarming gift for someone who has a good sense of humor? This unique hand lettered doormat is the answer. 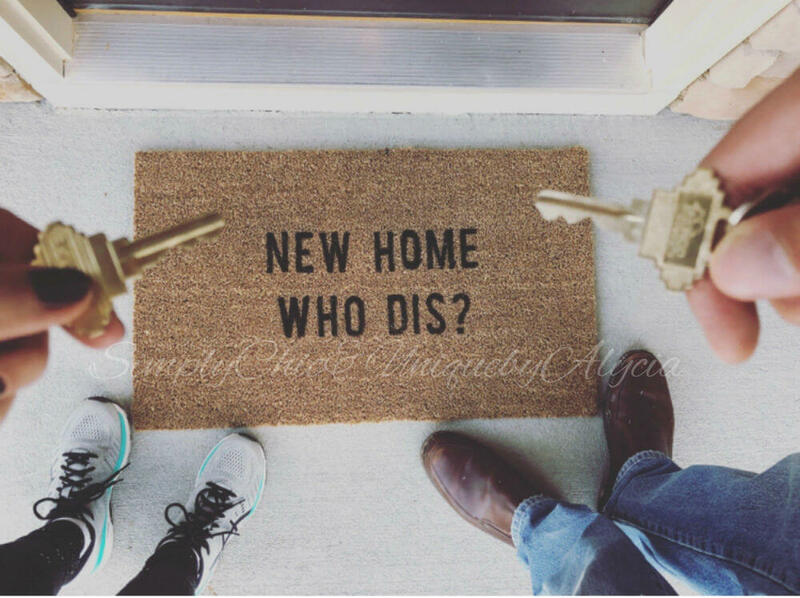 Made from 100% natural coir and outdoor acrylic paint, you will love its message of “New Home Who Dis?”. The doormat has a non-slip back so it is both practical as well as decorative. Umbrellas are one of those necessities that you want to have handy but are awkward to store. 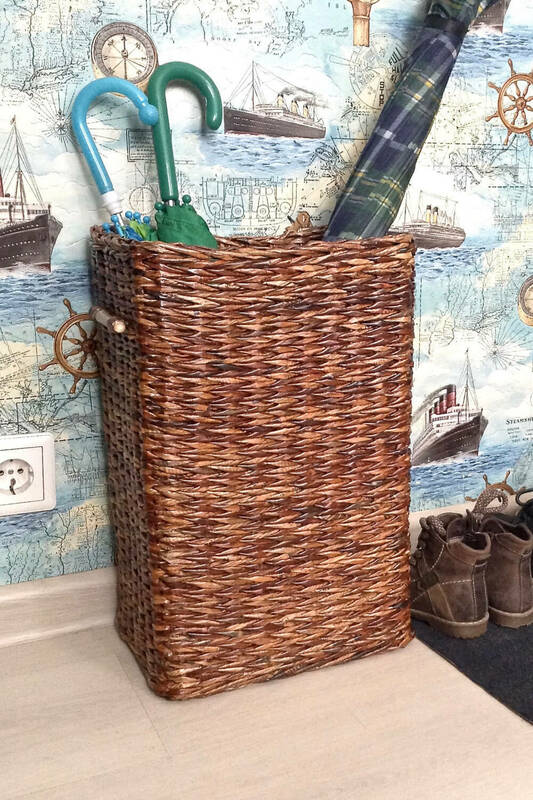 This tall wicker basket offers a beautiful solution. Made from durable wicker, the warm brown color makes it a great addition to any entryway. Each basket is made from recycled paper, coated with varnish for lasting endurance and moisture resistance. The entry to your home is the place you greet guests and where you gather your things for the day. So it needs to be warm and inviting while remaining practical and organized. These 45 entryway decor ideas will give you the inspiration you need to transform this vital part of your home. Whether you love rustic, farmhouse or modern, you will find plenty of ideas to create a unique space for yourself, your family, and your friends. These inspirations can stand on their own but combine into infinite options. Browse these entryway decor ideas and start your own transformation.